Eye On Tampa Bay: It's A Tax Hike! 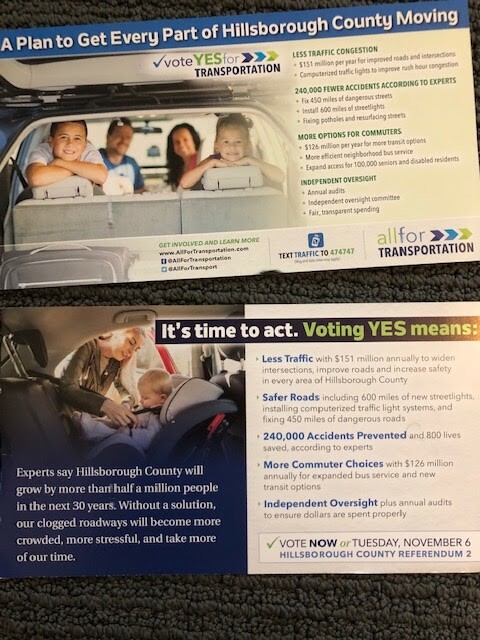 All for Transportation is the community-led effort that put a referendum on the November ballot asking voters to fund a wide range of solutions to our County’s greatest shortcoming – traffic congestion and lack of transit options. 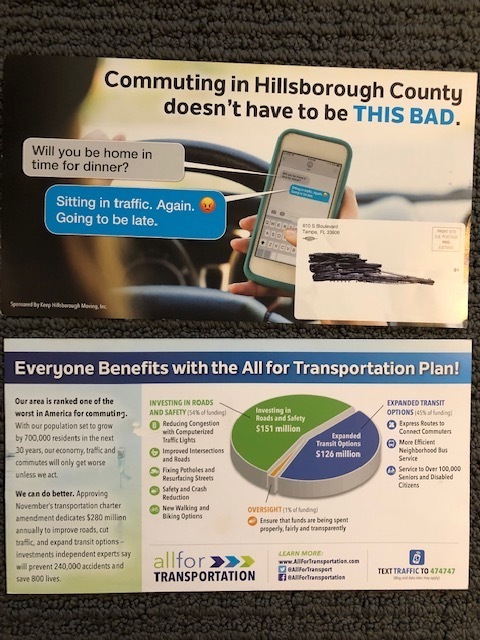 All for Transportation sold their 30 year $16 Billion tax hike as a transportation plan to fix the transportation issue in Hillsborough County. 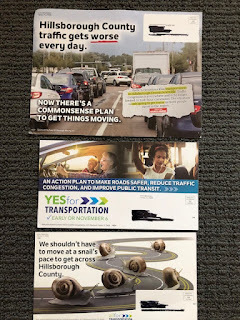 The Eye has 14 All for Transportation mailers and not one of them has the word "tax" on them. 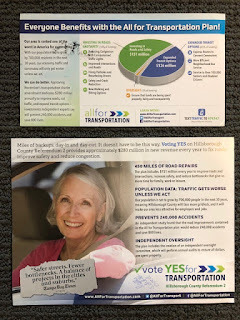 All for Transportation put a 30 year $16 Billion tax hike on the ballot they refused to call a tax. 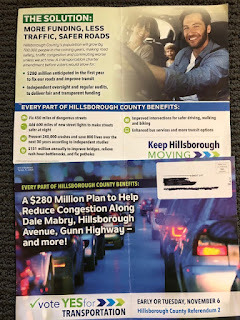 They sold their massive tax hike as a "plan" that will fix and reduce traffic congestion in Hillsborough County. 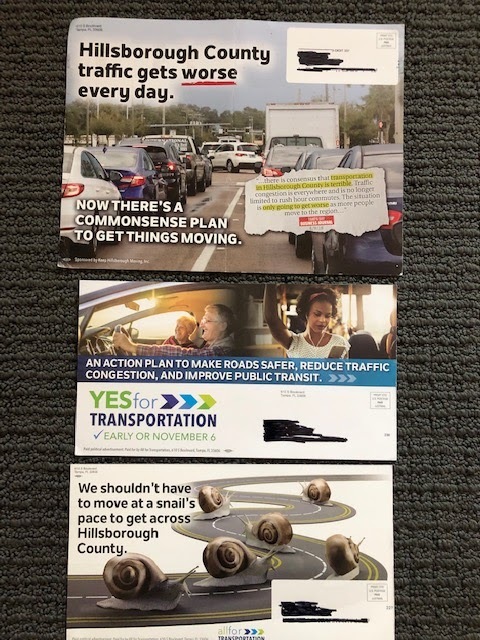 Below are copies of some of All for Transportation mailers they bombarded voters mailboxes almost daily before the election. Nowhere do they mention or use the word "tax". We compared the ballot summary language of previous tax hike referendums in Tampa Bay. funded with 1/2% sales surtax levied for ____ years and deposited in an audited trust fund with independent oversight? A 1/2% sales surtax is estimated to raise approximately $117 million annually or $234million in the first two years. 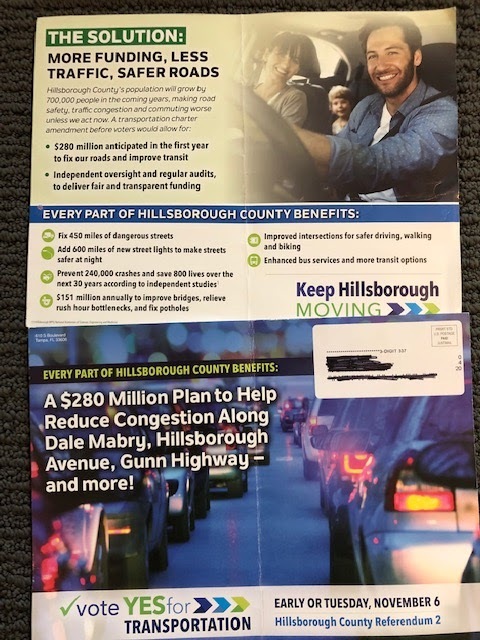 The revenues will be shared by Hillsborough County Board of County Commissioners, incorporated cities of Tampa, Plant City and Temple Terrace, and HART (Hillsborough Transit Authority), with revenues to the County and the Cities distributed using a population based formula. All funds must be used as provided in an approved Community Transportation Plan. Summary: Shall the improvement, construction, operation, maintenance and financing of public transit benefitting Pinellas County, including an expanded bus system with bus rapid transit, increased frequency and extended hours, local passenger rail and regional connections be funded by levying a one percent sales surtax from January 1, 2016 until repealed, with the proceeds deposited in a dedicated trust fund? Below is the language used by All for Transportation on their citizen petition tax hike charter amendment they got placed on the 2018 ballot. By amending the County Charter to enact a one-cent sales surtax levied for 30 years and deposited in an audited trust fund with independent oversight? 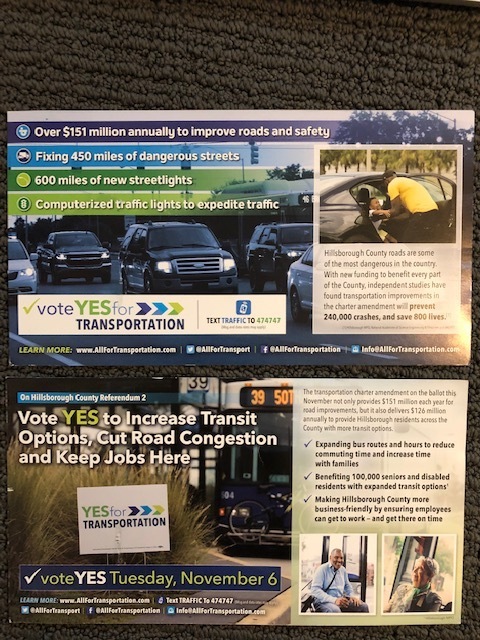 The county is required to include a financial impact statement and that statement was placed on the ballot initiative before the Y N.
All for Transportation did not use the word tax in the title of their tax hike referendum. They refused to call the tax to be levied what it actually is - a 1% sales surtax. It is not a one-cent sales surtax. Tax rates are never specified in dollars and cents, they are specified in percentages. Section (1) (b) of Florida Statute 212.055 which governs the transportation surtax states "The rate shall be up to 1 percent." There is no way to equate a one-cent tax to a one percent tax. On a $100 purchase, a 1% tax is one dollar while a 1 cent tax is one cent. Any tax hike referendum should use the same tax rate language allowed by the state statute that governs the tax and empowers the county to implement the tax. 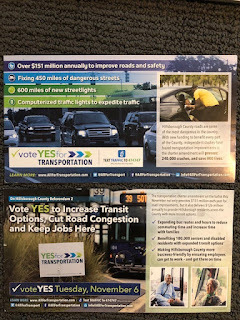 All the other proposed transportation sales surtax referendums drafted by elected county commissioners made it crystal clear to voters they were voting on a tax and its specific tax percentage. 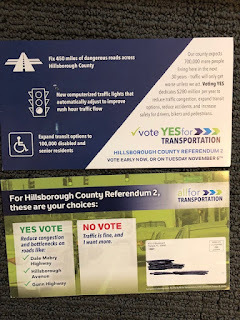 All for Transportation did not follow such ballot language. Perhaps that is another legal question that legal minds need to answer. Legal or not, it reflects a level of dishonesty. A one-cent tax sounds much less intrusive to one's wallet than 1 percent. 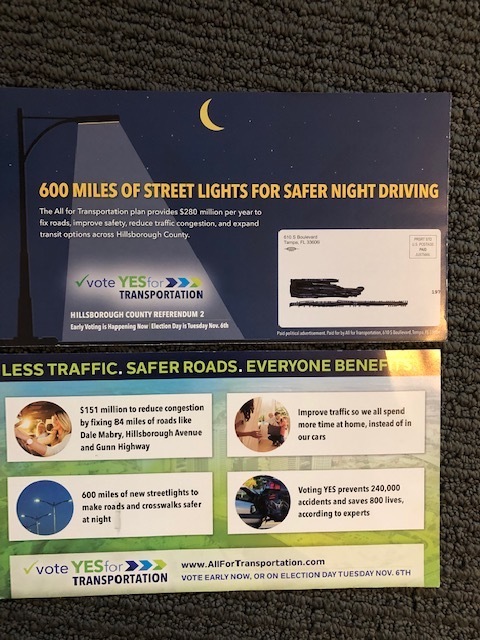 All for Transportation did not want voters to clearly understand that raising the sales tax rate one percent for 30 years is a $16 BILLION tax increase. Using the one-cent description enabled All for Transportation's pro tax hike media accomplices to parrot them. The media accomplices parroted the one-cent in the gobs of free earned media they provided All for Transportation for what is actually a 1 percent tax hike. 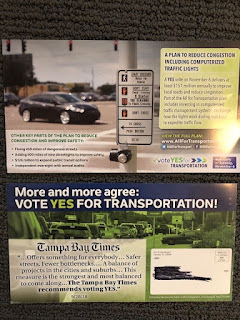 Search Tampa Bay Times reporting on All for Transportation. They parroted the one cent verbiage in instead of reporting that the referendum was raising the sales tax rate by 1%, which is a 14% tax increase. Now after the election, the Times is already backpedalling on what they previously reported. Vinik's editorial in support of the tax hike he was funding looks like it was written by All for Transportation. 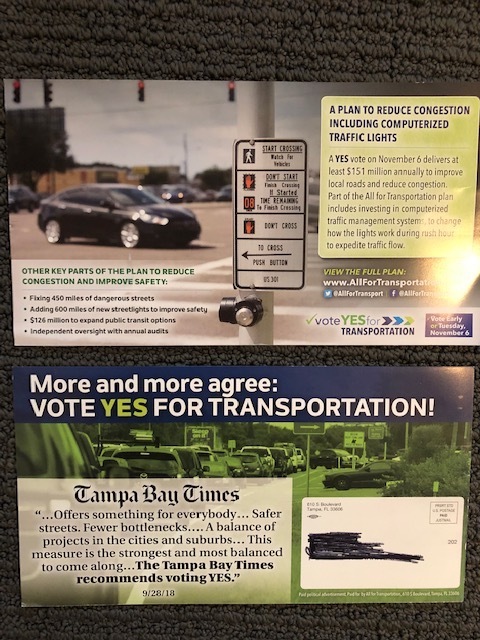 His editorial, published in the Tampa Bay Times that he bailed out, parroted All for Transportation by dishonestly stating "the cost is a one penny sales tax increase". 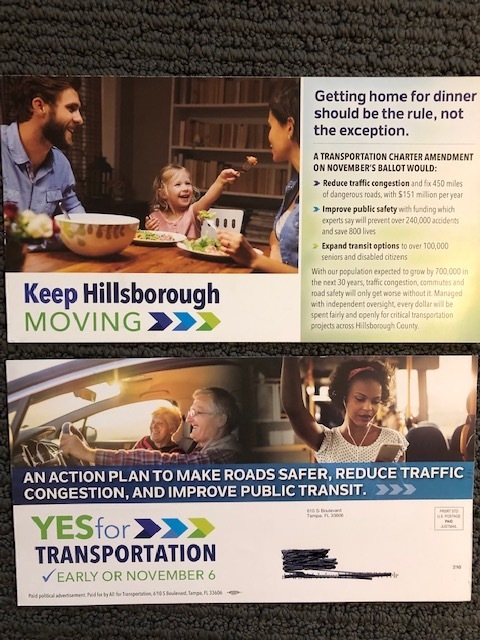 All for Transportation's dishonest campaign began with the ballot language they used written by a few downtown transit advocates over drinks. 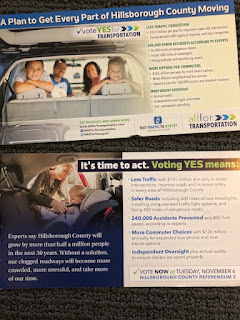 With a campaign war chest of $4 million funded by special interests, All for Transportation hit the campaign trail to never mention their tax hike referendum was a massive 30 year $16 Billion tax hike. In their expensive, glossy mailers, All for Transportation made lots of promises and claims to reduce traffic congestion with no evidence to back up such claims (post for another day). Intentionally missing was what voters were actually voting on, a massive 30 year tax hike. Even now after the election, All for Transportation refuses to call their tax hike a tax. The All for Transportation FB page continues to dishonestly describe their $16 Billion tax hike as a "plan" - that as we posted here does not exist. All for Transportation refuses to call their tax hike a tax hike. But a tax hike is a tax hike is a tax hike. And now Hillsborough County has the unfortunate distinction of having the highest sales tax rate in the state. This tax increase will amount to hundreds of dollars for the average family, many of which can't even afford the current tax of 7%. Considering how voters were mislead with the deceptive "one cent" verbiage, it would be appropriate if the legislature passed a bill strictly limiting the collection of the tax to the way it was presented. In other words, the transit tax would only apply to purchases of $1. The tax could not be invoked on purchases above or below $1 because this referendum, as written, only authorized the collection of "one cent" per purchase and the only amount that would qualify, as such, would be a purchase amount of exactly $1. 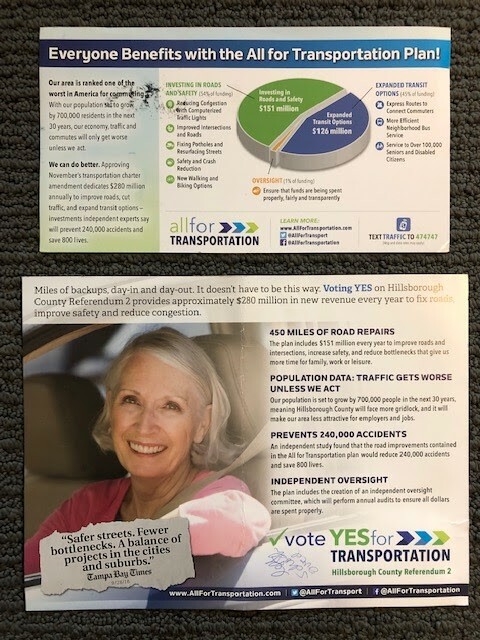 Why no photo in their mailers of a train (euphemistically called fixed guideway in their plan) when the tax funds rail $1.5 Billion? Could it be their polling told them not to reference trains or taxes or the voting majority would vote NO? Tyler Hudson sent me a text touting AFT. I told him to stop texting me his scheme is fraudulent. He replied with a dog laughing and saying "hehe" He thinks it's funny to defraud the public.